Imagine someone whispering in your ear non-stop: “Why would you bother, you will never find out the truth.” Sometimes the voice could grow to an unbearable scream. One of the basic tools of pro-Kremlin disinformation is to fill the information space with constant noise to confuse the audience – or to at least force it to stop paying attention. A recent target of this disinformation method has been The European Center of Excellence for Countering Hybrid Threats (Hybrid CoE), hosted by Finland. This week, pro-Kremlin attempts to obscure the public discussion around the center grew in both quantity and absurdity. Finnish MV-lehti published an article claiming that the “NATO hybrid center has a license to kill”. Actually, the Hybrid CoE is not a NATO center, but an instrument of its participating countries: Estonia, Finland, France, Germany, Latvia, Lithuania, Norway, Poland, Spain, Sweden, the UK and the USA. More fundamentally, the center obviously doesn’t have a license to kill, as no one has in Finland. But the orchestrated disinformation campaign does not end up with one article. What we also saw was the setting up an organization with a similar name that calls NATO and the EU a threat to democracy in Europe. And in order to further confuse the public, a website was launched – http://hybridcoe.ru/ – [note the Russian domain] – that copies the design of the real center. Fake Twitter accounts resembling the Hybrid CoE logo have been circulating since autumn 2016, and some of them got activated again in September. This account has been spreading a message that Finnish citizens would be unhappy with the new Hybrid Center – referring to comments on other disinforming outlets. Just so you know, these are the actual web page and the Twitter account of the Hybrid CoE. One of the aims of the pro-Kremlin disinformation campaign is to twist the narrative of WWII. This time, weekly Russian news show Vesti Nedeli accused Poland of initiating the second world war. We’ll leave it to more reliable sources than Vesti Nedeli to set the record straight on this. But the Russian audience is constantly exposed to this parallel reality. 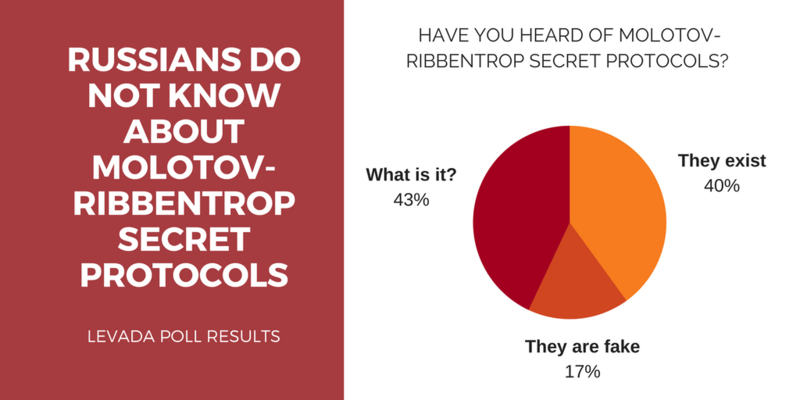 And the results of this disinformation campaign are clearly visible for example in a Levada Center poll on the Molotov-Ribbentrop secret protocols, which reveal that 40% of Russians think it’s true, 17% think it’s false, and 44% are not aware or unsure that the protocols existed. This week’s disinformation cocktail also included some favorite disinformation themes. We read that Europe’s excessive tolerance towards other religions results in punishing “true” Europeans, and in discriminating against orthodox values. So disinformation outlets reported about a man being fined for eating bacon in front of Muslims in Sweden and about a Georgian judoka who suffered defeat during the course of the World Championship for wearing a cross around her neck. Visit our table to set the record straight on these two entertaining stories. And the favorite narrative about EU orchestrating color revolutions was revived once again. Thus, in a Moldovan disinformation-oriented outlet, the readers were convinced that if the country refuses to join the EU, Brussels will punish it with a Maidan. We are sorry to disappoint, but it is not in EU’s capabilities to instigate a nation-wide revolution. What can Ukraine offer NATO?